While the Dallas Cowboys appear set for many years at starting quarterback, that doesn't mean they won't ignore the position completely in the 2019 NFL Draft. In recent years, it appears that Dallas is wanting to establish a solid pipeline of QB talent and create competition along the depth chart. Remember that in 2016 Dak Prescott was originally drafted to be groomed behind Tony Romo. The preseason brought an unexpected change, but the Cowboys invested a mid-round pick in the QB position for the first time since Stephen McGee in 2009. Two years later, Dallas used a fifth-round pick on Mike White. 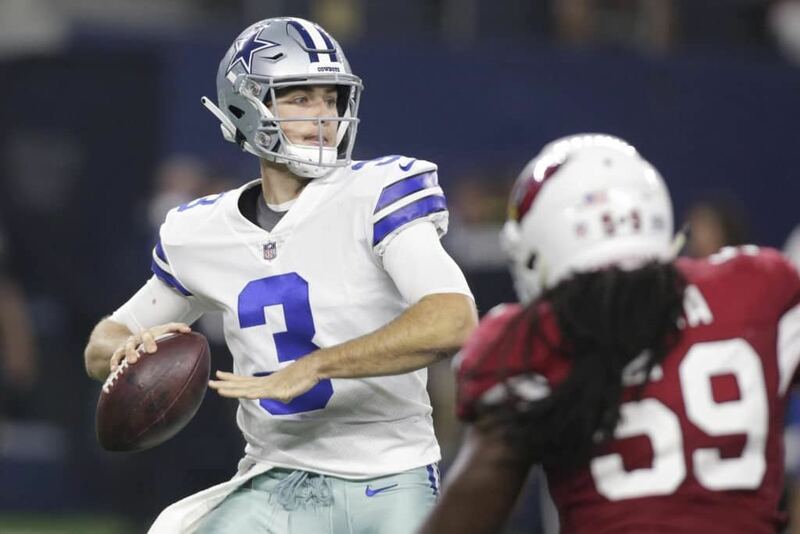 Even though they already had Cooper Rush, who had been very impressive in the 2017 preseason, the Cowboys drafted White to bolster the depth chart and compete with Rush. That being said, it's unlikely that the Cowboys would draft any QB before Day 3 of the draft. In fact, it probably wouldn't be until the seventh round. Having just spent a mid-round pick on Mike White last year, the Cowboys will likely want to give him this year to develop and show what he's got. They also may be hoping for a bounce-back year from Cooper Rush, who didn't repeat his exciting 2017 play last season. But if an intriguing 2019 prospect like Jacob Dolegala or Brett Rypien were to be available in the final round of the draft, Dallas might go ahead and grab one of them. Neither Rush or White showed enough last season that they should be untouchable. Rypien is definitely someone to keep an eye on. He graduated from the Cowboys' unofficial farm system, Boise State, where they've drafted several players over the last few years. He is arguably the second-best QB to play for the Broncos other than Dallas' new offensive coordinator, Kellen Moore. He also has NFL pedigree as the nephew of former Redskins' QB Mark Rypien. Rest assured, Moore is very familiar with Rypien as fellow Boise St. alumni. If Kellen is at all interested in working with him, that connection could easily bring Brett to the Cowboys. But that's about all we should expect from the 2019 draft when it comes to Dallas and the quarterback position. Outside of some intriguing prospect that they don't want to risk having to compete for in undrafted free agency, prompting them to use a late-round pick, the Cowboys will likely focus on positions of greater need.